This type of anchor chart might be my favorite to use with students. This is such an effective visual to help students compare two texts. The interactive nature of the chart also makes it reusable with multiple texts. 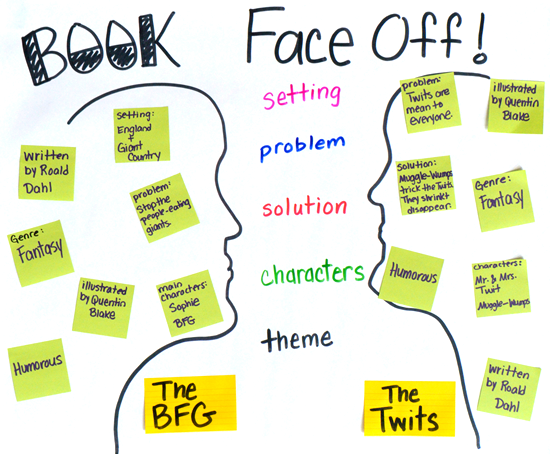 For this particular chart, we were comparing The BFG and The Twits as part of a larger unit using Roald Dahl books. This can be done with books read aloud as a whole group or with books read by smaller strategy or guided reading groups. This is also effective when analyzing books from the same genre. Compare two poems, dramas, or arguments on the same topic. This can easily be done across multiple genre and author studies. Create this chart with the title and silhouettes only. Laminate this blank chart, then use dry erase markers and different color sticky notes to reuse this chart with different texts. Instead of making one chart, make two or three. Students can use these in groups to compare texts at the same time. You can keep an exemplar up in the classroom for students to refer to and still interact and use the chart with students. Color-code the sticky notes according to elements that are unique to each book and use a third color for qualities that are present in both. Switch out the categories in between the silhouettes with the skills that you want to focus on or encourage your students to look for. This can be as expansive or as narrowly targeted as you want. Thanks for sharing, I like your charts and your books. Cute chart! I love all of the visual learning that you promote! I just bought both of your Chart Sense books and plan to share with my whole team!! Thanks for making this easier to manage! I will be coming back to you website for more soon. Thanks for providing me with strategies that I can help my students to be successful in middle school. I am a fifth grade language arts teacher. I will visit your website again.